DARE designs and fabricates its own electronics packages for use in DARE rockets. These electronics package may range from fairly simple timer based designs for use in small rockets, to full flight computer for use in rockets like the Stratos III. One of the primary functions of the electronics in any rocket is the timely deployment of the recovery system. In a case a parachute needs to be deployed, it's in most cases beneficial to deploy the parachute at apogee. For more complex rockets the electronics may also be tasked with igniting a second stage or recording data from accelerometers and GPS receivers. The record setting Stratos II rocket also had a real time telemetry unit on board, relaying the position of the payload capsule for recovery. The electronics team creates the electronics for all projects within DARE. Below are some of the recent systems the electronics team has designed. 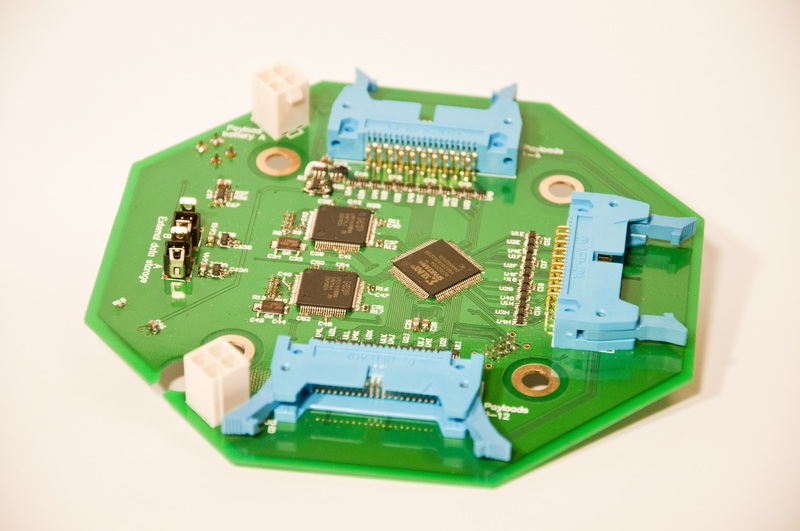 The Electronics Team worked on the design and development of flight electronics and software for Project Aether. 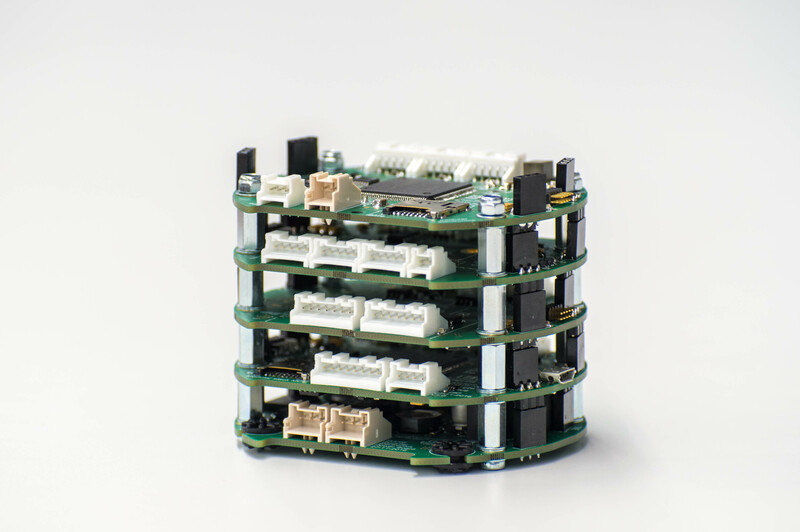 The Aether electronics stack, consisting of 5 Printed Circuit Boards (PCBs). Processor: 2x LPC4313 for Kalman filter computations (redundant), 1x Spartan 3A FPGA for payload data acquisition, in total 10 LPC1751 for various other tasks. Power Source: 3x 1250 mAh at 11.1V for video downlink and payload power supply, in total 12x 450 mAh at 7.4V for various other tasks, external power supply at 12V 3A while the rocket is in the tower. Two independent measurement systems, each having its own GPS, static air pressure sensor and two triple-axis accelerometers, gyros and magnetometers, with a Kalman filter for sensor fusion, used for apogee detection and flight termination. A digital downlink and three independent storage systems for sensor and status data from the rocket and the payloads. An analog uplink for remotely shutting down the motor. An FPGA for merging and distributing the incoming data streams from the rocket and the payloads to the data storage and downlink. Fully redundant actuation system, each taking its input from the two measurement units and timers. Advanced independent power supplies for each system, most having two battery inputs for redundancy with voltage and temperature measurement. Payload power supply with current consumption measurement for each individual payload. 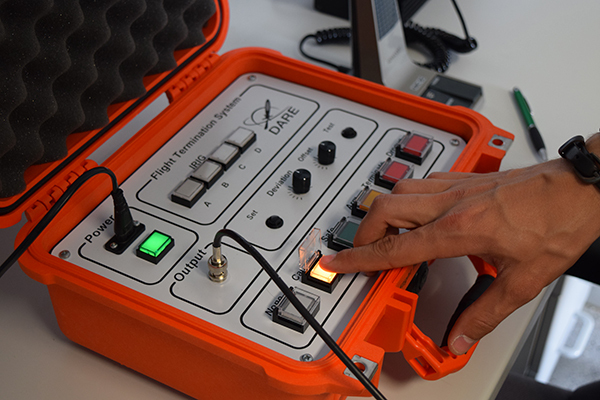 To be able to include a reliable safety system in Stratos II+, the electronics team designed a flight termination system to be used over a range of more than 50km. The system is designed to be able to terminate the flight in case of failures during launch. The flight can be terminated actively by pushing a button or in case of signal loss, the flight will be terminated automatically. Power Source: 2x LiPo 1800mAh at 7.4V for servos, 1x 300mAh at 7.4V for board. The electronics team contributed with the advanced control board enabling the rocket's canards to keep it on flying as close to vertical as possible, in turn making the landing area closer to the launch site and increasing the maximum altitude. 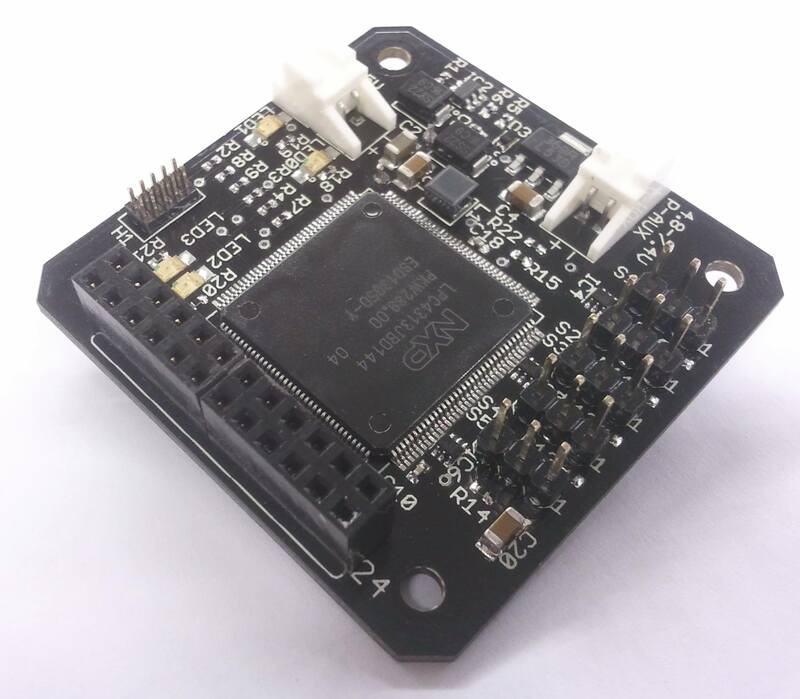 Processor: 3x LPC1313 for servos, 1x LPC1313 for main control unit, 1x ATmega168 for external interface. 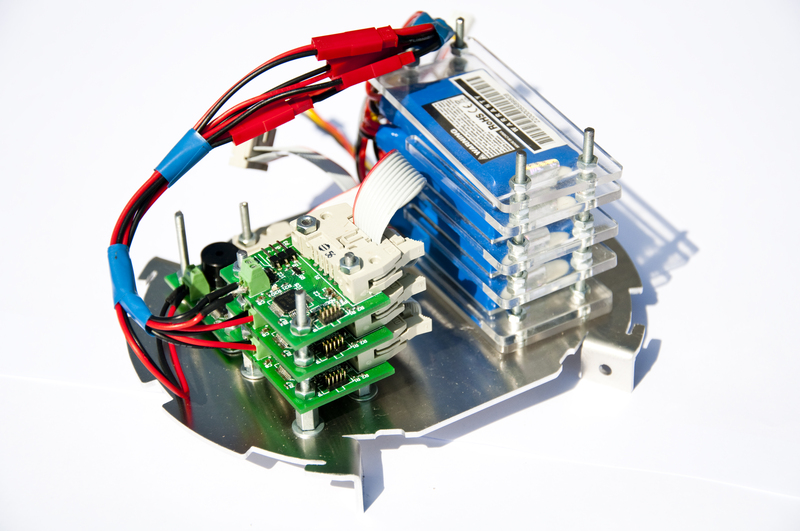 Power Source: 3x LiPo 500mAh at 7.4V for servos, 1x LiPo 500mAh at 7.4V for main control unit. The CanSat electronics have been continuously refined and improved over the years. 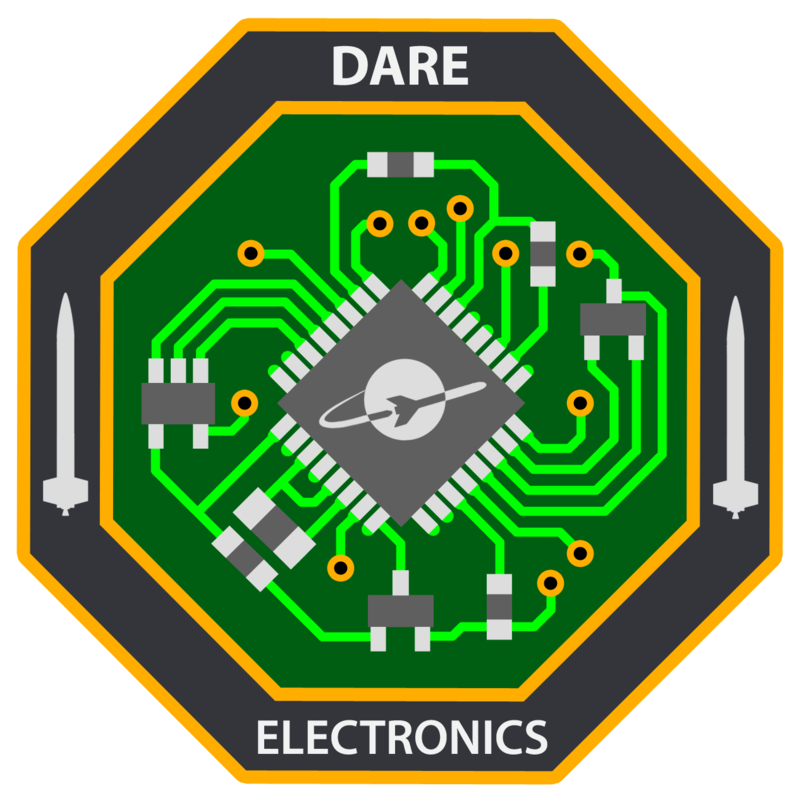 Based on DARE's previous experiences, the choice was made to have 4 independent microcontrollers, two boards each controlling a door, and all with the authority to deploy the parachute. Each board also has its own power source, again for redundancy. With this approach, each board can function on its own after launch.